Night has fallen here. Not far from Christian holy sites, Israeli gunfire hails on Bethlehem. Palestinian gunmen just killed an Israeli settler driving nearby, and for more than an hour, Israeli tanks and machine-guns have fired on Bethlehem's residential areas in an unsuccessful attempt to seek out the Palestinian shooters. The townspeople sit in the dark, listening for ambulances and waiting for the battle to subside. Just a week earlier, Ariel Sharon was elected prime minister of Israel and already the tension is building. Since the February 6 election, Palestinian attacks on Israeli settlements have increased--only to be met by intense Israeli retaliation. On February 8, Israeli tanks shelled the Palestinian towns of Ramallah and Al-Bireh for four hours straight. Despite severe damage to Palestinian homes and a medical clinic, no one on either side was seriously injured. "Sharon's success has introduced an escalation," says Abbas Zaki, a leader of Fateh, Palestinian President Yasser Arafat's political faction. "Silence means acceptance. If we say no to the intifada, it means that we accept the new Israeli realities. We have no other choice but to continue our uprising." Ramallah. 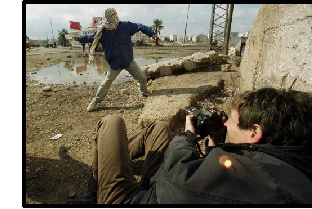 Photojournalist Laurent van der Stock (foreground) was shot in the leg during the clash. Palestinians, he will always be known as a warmonger. His record includes overseeing a 1953 attack on a Palestinian village in which 69 people were killed; and, defying military orders, disastrously pushing into the Sinai Peninsula in 1956; and, of course, crafting Israel's 1982 invasion of Lebanon, well known for the massacre of more than 1,000 Palestinian refugees under Israel's watch. Despite these atrocities, the international community has welcomed Sharon. President George W. Bush was one of the first to congratulate the new Israeli leader, assuring him that Israeli-American relations remain "rock-solid." The European Union added its welcome and said in a statement that it hopes Sharon "will keep the peace process alive and continue the dialogue according to the wishes of all the parties concerned." Palestinian diplomatic leaders are adopting a wait-and-see attitude. "The ball is now in the Israeli court," says Palestinian negotiator Saeb Erekat. "If they want peace, we are well prepared. However, our peace will not come at any price. The way to peace and stability is through the withdrawal of the Israeli occupation." Judging from previous statements, Sharon is unwilling to go that far. He rejects Palestinian autonomy over East Jerusalem, even though Palestinian-Israeli peace accords thus far have been premised on U.N. resolutions calling for Israel's complete withdrawal from that half of the city. Sharon also maintains that Palestinians do not really want peace. Of his visit to Haram al-Sharif, Jerusalem's Muslim shrine (which Jews call the Temple Mount) that marked the beginning of the ongoing Palestinian intifada, Sharon said, "I unmasked the Palestinians. We saw their true intentions." The Al Aqsa uprising, as this Palestinian revolt has become known, has taken on the look and feel of guerrilla warfare. While the first intifada of the '80s included Israeli boycotts and public strikes, this uprising is increasingly a violent push against Israeli targets led by localized militia groups. The Palestinian public remains stalwart, but the effects of Israel's four-month closure of Palestinian villages and towns are taking a toll. The Israeli economic closure preventing the movement of goods has pushed one-third of the 3 million Palestinians below the poverty line of $2 a day. Courts and government offices are barely functioning, and public anger against the lack of work and government control is palpable. In Ramallah, one taxi driver frustrated at traffic yelled angrily at a police officer: "Everything broken in this area is the responsibility of your bosses." Open internal rifts have observers concerned that the uprising is turning upon itself. In the Gaza Strip, Arafat's elite Force 17 security was deployed in the streets after a personal dispute in which some 50 men wielding guns and grenades destroyed a local club. In a later Gaza incident, fighting broke out when a refugee family refused to heed the summons of Palestinian security officials. "There is a state of apprehension and fear, of heightened anxiety on the street," says Eyad Sarraj, a mental health professional in Gaza. "People feel that the future is bleak." "I think the easiest way out for the Palestinian Authority is to direct people into a kind of war against Israel," Sarraj adds with disapproval. "That will again direct the energy outside." In coming weeks, this could make a volatile mix. Sharon maintains an interest in what he calls "creative" military options, according to a New Yorker interview conducted before his run for prime minister. As such, Palestinians in Israel and the occupied territories are prepared for the worst. Their leaders are trying to maintain calm. "We should face reality as it is," Azmi Bishara, an Arab member of the Israeli Knesset, told a forum before Sharon's election. "Don't panic."